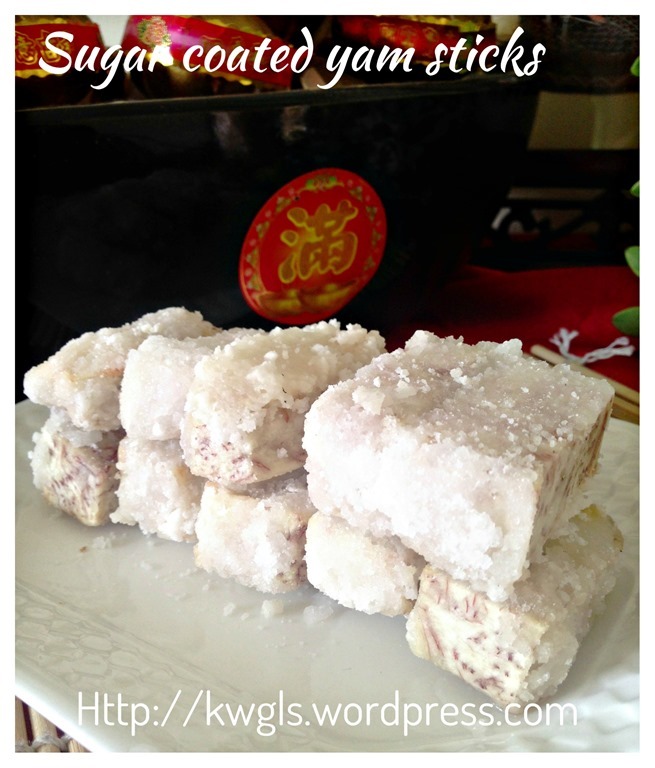 This is an easy peasy recipe but hard to master… I have tried many times and comes out with these rather ugly sugar coated yam stick.. Well, just to assure readers that if you are not able to do the coating properly, it is still nice to eat and worst come to worst, it will become thick syrup coated sugar sticks and that is another Teochew delicacies. As this Teochew or Chazhou dessert is not really common in Singapore and Malaysia restaurants, I do not expect many readers of other dialects know about this delicacy. However, it is rather common in Hong Kong and China’s Teochew or Chaozhou restaurant. 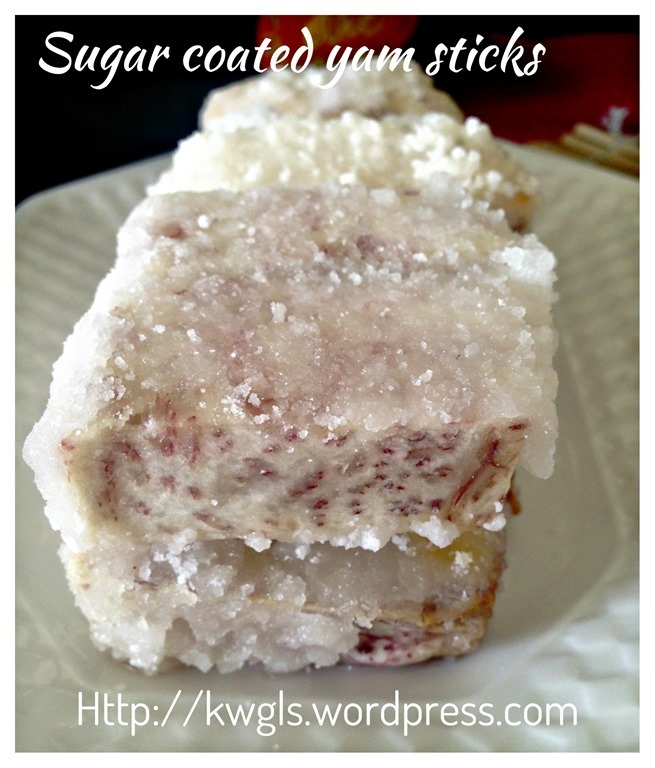 I do have a fair share of nicely sugar coated yam stick.s It is supposed to be crispy but when you bite it, the sugar become very sandy. Is it too sweet? Whether sweet or not will depend on one’s skill of coating and the size of the yam stick. 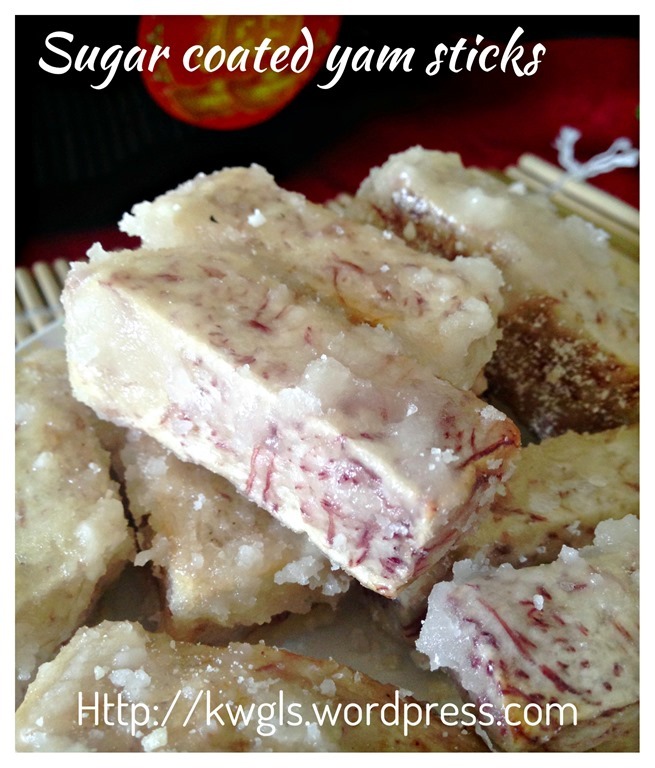 If you have over coated some tiny sized yam stick, it will definitely be sweet. If you have a thin coating of thick yam stick, it will not be sweet at all and pleasure is to bite the sandy sugar coated with the yam. Traditional, this dessert is served with a type of Chinese tea called kungfu tea which is not sweetened. Is it not balance off the sweetness. This recipe requires practise as it deals with recrystallization of sugar. When sugar is boiled with water, a syrup is formed. At 18 degree Celsius, sugar syrup is stable, When one continues to boil, water moisture is lost and syrup will become unstable as it is super saturated.When super saturated syrups cooled down, excess sugar crystals will precipitate and crystalize out of the solution those forming white crystalized sugar. Further boiling will caramelize the sugar syrup and when cooled, becomes a big piece of brown sugar is formed. 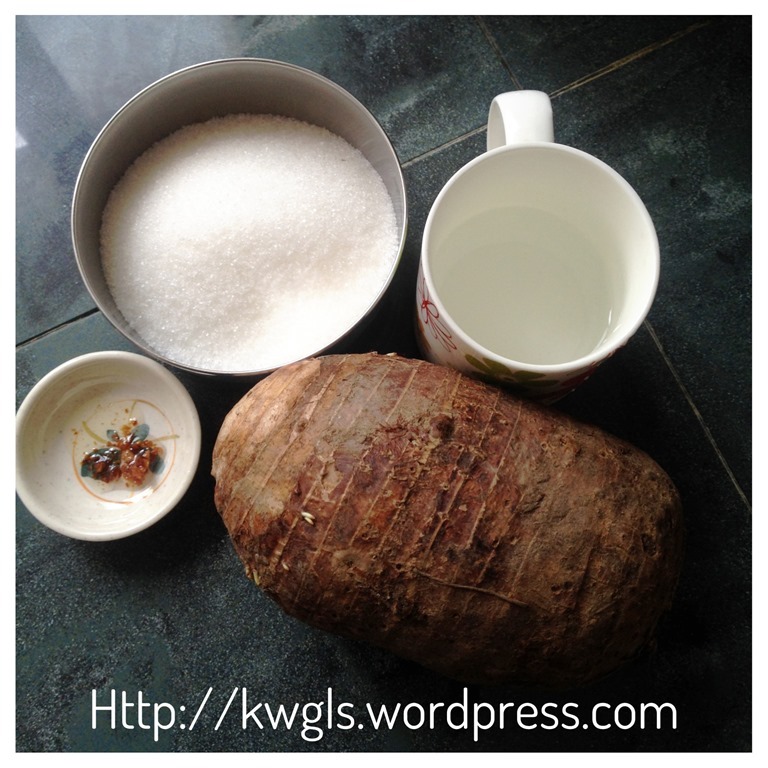 Therefore, essentially, one will only have probably 1 minute to properly coat the yam stick with white sandy sugar…. It does need practise and possibly that explains why the restaurant is charging rather high for a white coloured sugar coated yam stick.. However, the method that I am sharing is slightly different from what is written in Chinese Wikipedia. 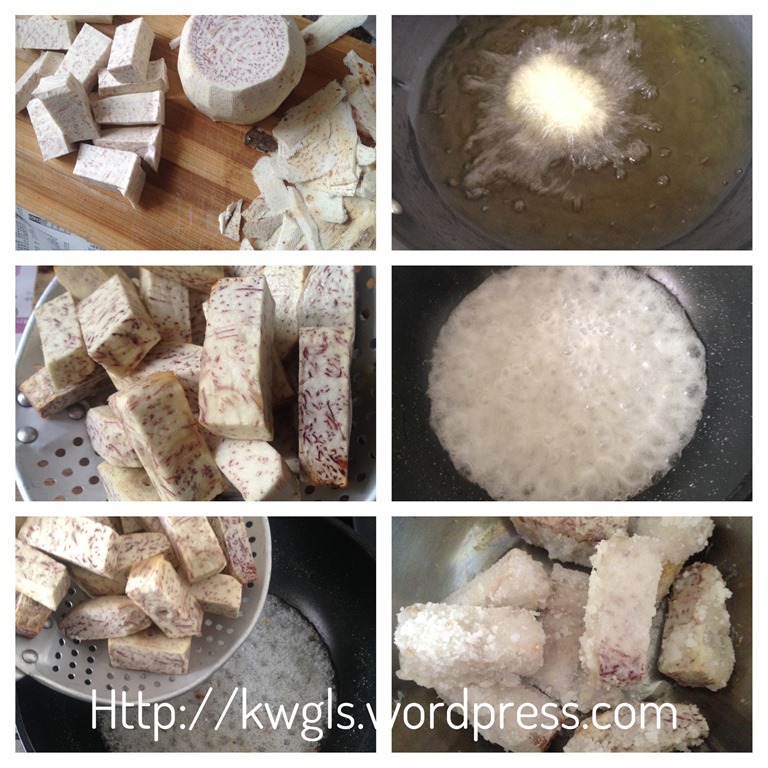 To make the yam more fragrant and easier to coat, it was pre-cooked before sugar coating was done. Skinned the yam, cut into finger size length and thickness. Deep fry in a pot of hot oil under medium heat until the yam is cooked. 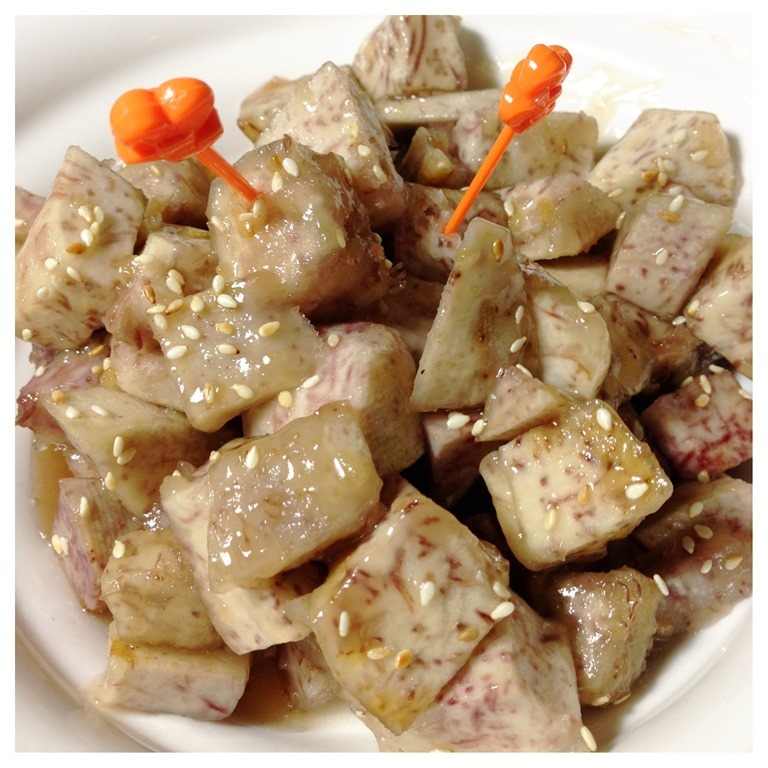 The yam is considered as cooked when one can easily insert a chopstick into the centre of of the yam. Drain and set aside. In another pan, add the sugar and water , bring to boil. Once it boils, you will witness some big bubbles being formed. The bubbles will become smaller and smaller upon further boiling as the syrup has thickened. Once the small bubbles are formed, add the deep fried yam stick and coat with syrup as evenly as possible. After 1/2 a minute, off the heat and continue . It is considered as done when you take a piece of yam stick out of the pan, the sugar starts to crystallize on the yam stick when it touches the air. 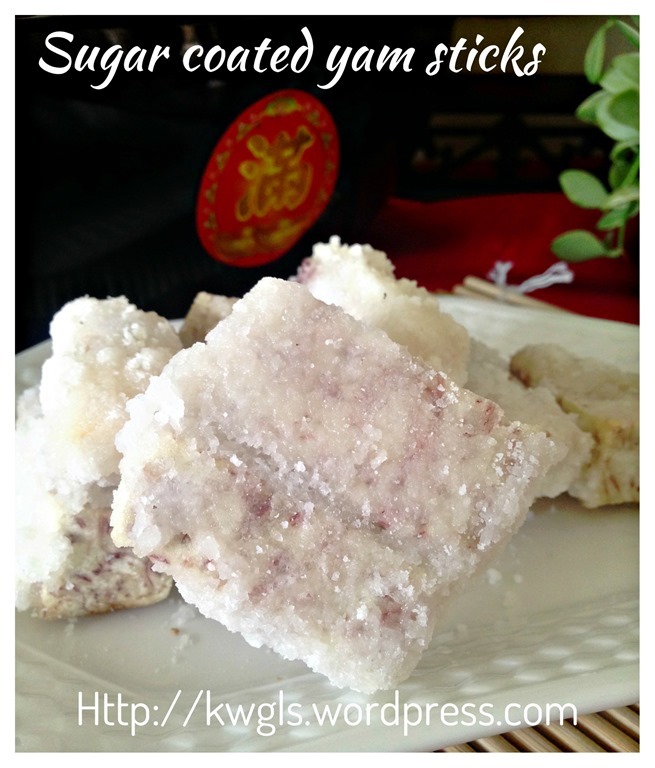 Best served as a dessert with a cup of Chinese tea. If it refuses to crystallize, continue stir frying under low heat to get rid of excess water vapour. If it over crystallizes, add a bit water to let the sugar dissolve and repeat the process again. However, the colour may not be whitish but slightly caramel in colour. 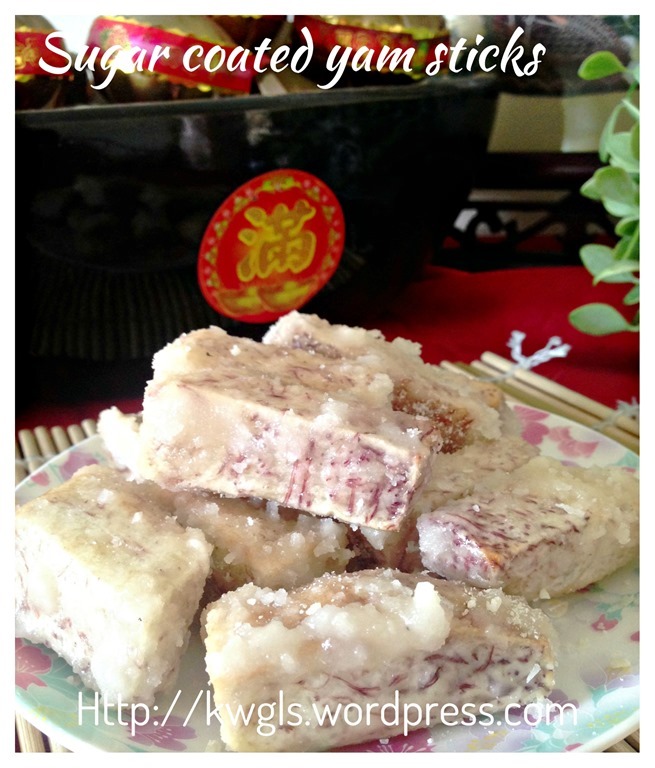 Personally, I need more practise on this Teochew dessert. The method is there and let learns together to master it. 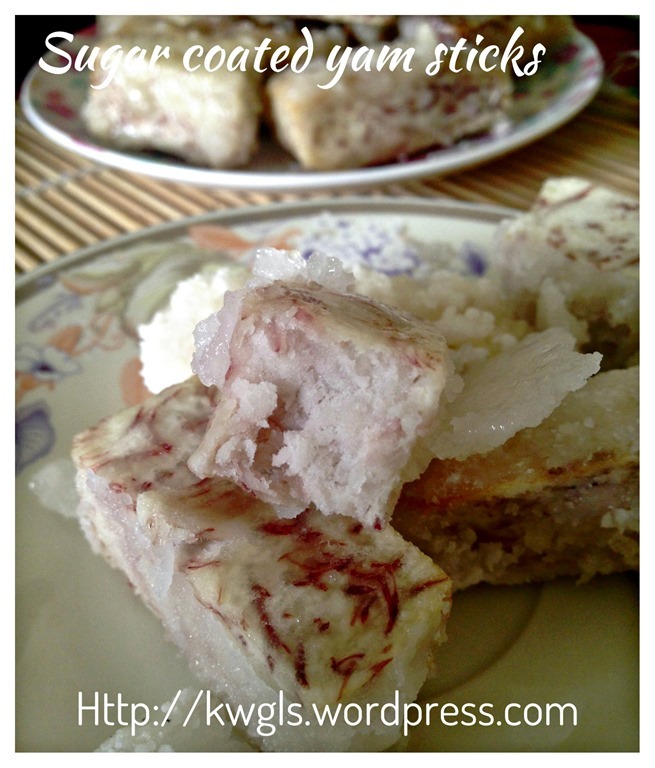 I hope this post will benefit readers who are looking for the recipe of this less known Teochew dessert. Again, sweet or not sweet is up to you how thick is your coating and how big is your yam stick. 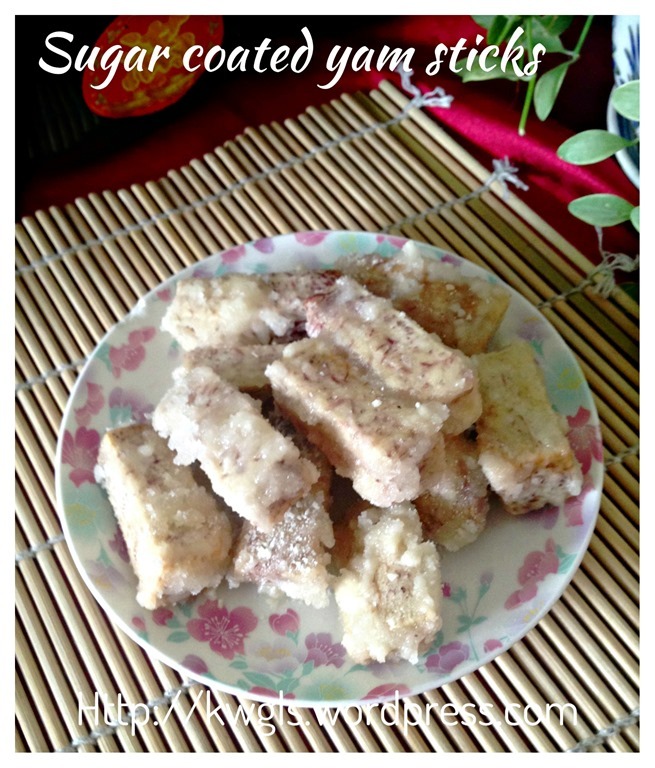 Even the coating is too thick, you can always scrap off the sugar when you are eating. 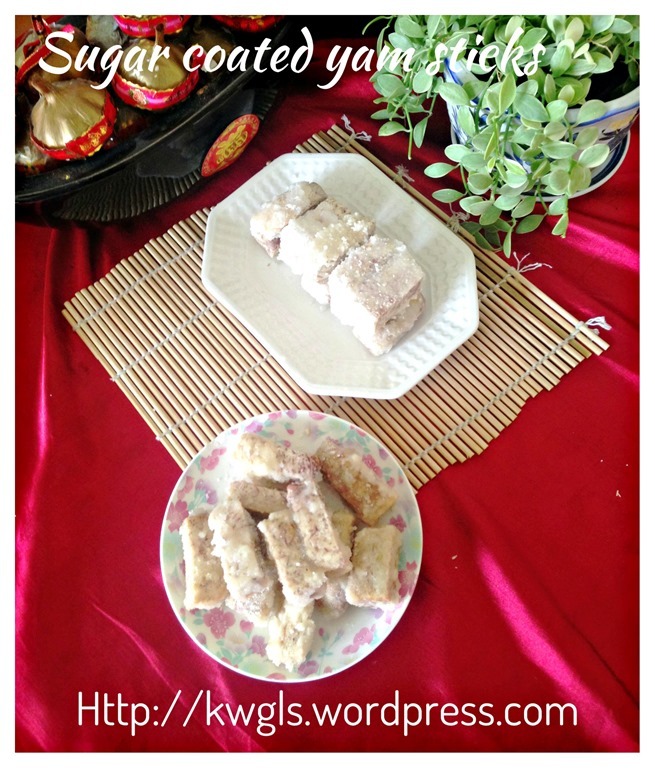 This entry was posted in Chinese and Asian Cakes and Snacks, Desserts, Food Preparation Series and tagged 8, 翻砂芋头, 高烧芋头，拔丝芋头， Yam sticks, GUAI SHU SHU, Guaishushu, huang sua or, kenneth goh, postaday, 反沙芋头. Bookmark the permalink. Thank you for posting this recipe. 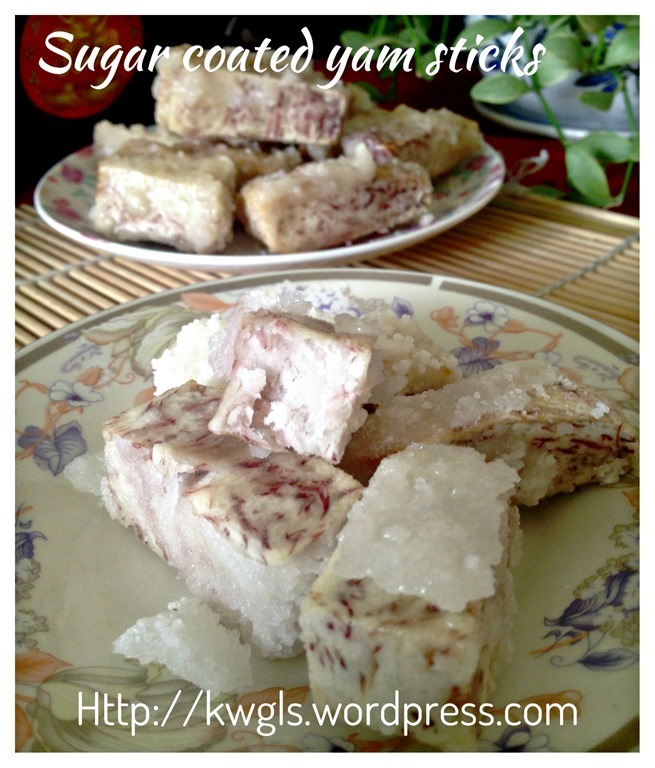 I am a pure Teochew from Taiping but my mother never made this before. 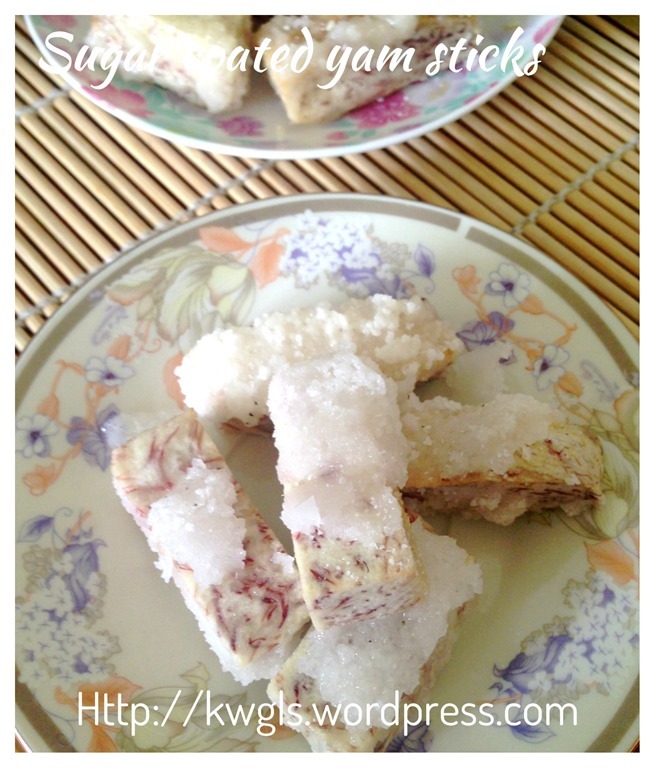 More than 40 years ago, my Hokkien neighbour used to make this sugar coated yam for every festive occasion and for prayers. She would gave me a big portion as I seemed to be the only one to enjoy it. Since going separate ways, I have not eaten this dish for more than 4 decades. Your recipe reminds me of yesteryears when neighbours shared dishes and this neighbour auntie who brings this delicacy for me to enjoy. Happy you like it . Do u hv chinese version for this? My aunt love this but she don’t know english. You can try google to translate this post.